Duration: Eat everything correctly. While eating everything, lightly close your lips and make sure they remain relaxed and that your tongue does not push forward against your teeth as you swallow. 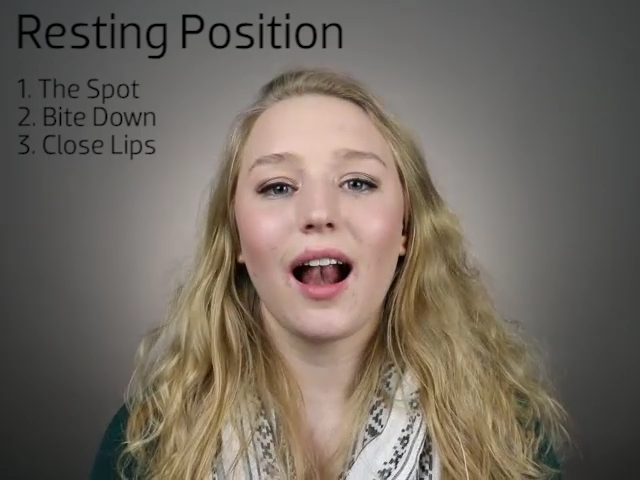 Relaxed Lips: Lightly close your lips and keep them relaxed. Swallow: Swallow the food making sure that your lips remain relaxed during the swallow and that your tongue does not push forward against your teeth. This exercise should be completed anytime you need to eat anything. At the end of each day you should track how well you completed this exercise. Write an "A" for "all" on the tracking sheet if you ate everything correctly that day. Write a "P" for "part" on the tracking sheet if you ate part of your food correctly that day. Write an "N" for "none" on the tracking sheet if you did not eat anything correctly at all that day. 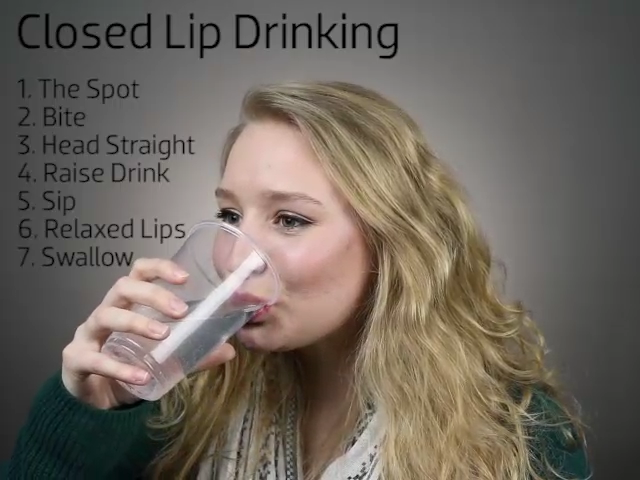 Duration: Drink everything you drink correctly with closed, relaxed lips. You can do this using either one swallow drinking or three swallow drinking. However, do not smile or open your lips before your swallow in these exercises. 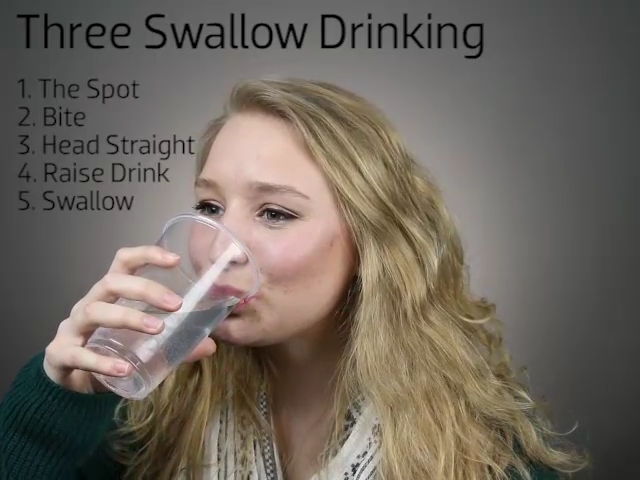 Swallow: Swallow the water making sure that your lips remain relaxed during the swallow and that your tongue does not push forward against your teeth. Repeat: Continue swallowing as quickly as possible. Practice in groups of 10 swallows with breaks in between each group of 10 until you have completed 100 swallows. Do not bite or chew the mint during the exercise. Try to keep your throat relaxed to assist in quicker practice. Move the mint around your mouth and tongue to increase your saliva production to make it easier to swallow frequently. You may require more than one mint during each practice. Relax your throat. Try to swallow short quick swallows. Keep track of your swallows in 10 swallow increments, trying to complete at least 10 swallows at a time before taking a break. Complete this exercise while going about your normal routine. Complete your 100 swallows while in the shower, getting ready for the day, while driving in the car, while sitting in class or at work, etc. Realize that the large amount of correct swallows completed during this last week of the program is helping to re-establish a new muscle memory swallowing pattern which will allow you to keep swallowing correctly in the future without having to focus your attention on your swallowing. While completing all 100 swallows, your tongue should not push against or past your teeth. Your tongue should not push forward at all. Click here to open Worksheet #10.